I have written previously about the plethora of research that shows a link between income and happiness. Most of those studies find that the more money people bring in, the happier they are—until earnings exceed $75,000, at which time the correlation declines. What I’ve never thought to address when I have reported on these studies is how debt affects the income to happiness ratio. I inherently assumed that the income level was free of consumer debt, meaning the individual lived on what they made. The only debt I assumed was a mortgage payment, that also included property taxes and insurance, of no more than 25% of income. This means a family earning $75,000 has a maximum housing cost of 1,500 per month. In Rapid City, SD, that will get you a very comfortable, upper middle-class home or rental. Further, I assumed any increase in income meant no corresponding increase in consumer debt. A few comments from readers who didn’t understand my unwritten assumption opened my eyes. One man—I’ll call him Sean—said my data must be flawed. For him, a significant increase in income when he graduated from college did not increase his well-being but actually created increased ill-being. When Sean graduated from college he was earning $20,000 at his minimum wage job but had no debt. Upon graduation he secured a position paying $70,000 a year, which theoretically should have had him doing a financial happy dance. Here’s what happened instead: He upgraded his paid-off clunker for a brand new car, taking on a $45,000 debt with an $823 a month payment. From dorm living at his state school of about $500 a month, he went to a $1,500 a month mortgage payment on a starter home he bought for $225,000 with a $25,000 down payment gifted to him by his grandparents. To furnish the house, he ran up a $20,000 balance on his credit card, which meant monthly payments of $750. His student debt of $80,000 kicked in, with payments of $750 a month. That’s $3,323 a month in additional spending, or $39,876 a year, and a total debt of $345,000. That means his $70,000 new job was actually the equivalent of earning $30,124 a year with no debt. No wonder he wasn’t happier. A study from Purdue, “Debt and Subjective Well-being: The Other Side of the Income-Happiness Coin,” published in the Journal of Happiness Studies, finds my hunch was right. More income coupled with more debt does not mean more happiness. In fact, as in Sean’s case, it often means just the opposite. The study specifically targeted the impact of college loan debt on students who had been out of college and in the work force for seven years. The study found the higher the debt to income ratio, the lower the overall happiness. 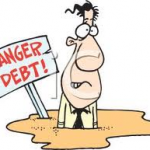 In another study from the University of Wisconsin-Madison, “Household Debt and Adult Depressive Symptoms,” researchers Lawrence M. Berger, J. Michael Collins, and Laura Cuesta found that consumer debt is positively associated with ill-being and greater depression. The groups most affected by consumer debt are those less educated or who are approaching retirement age. My recommendation for financial well-being is that, if you have to borrow to buy something other than real estate, don’t. Keeping your financial obligations to a sensible amount of long-term housing debt is the best foundation for building financial well-being. 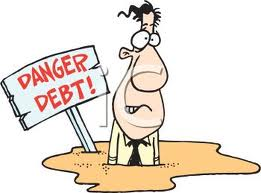 Don’t let an increase in income lure you into an increase in debt. When you keep your consumer debt load small, earning more money is much more likely to increase your overall happiness and well-being.